LRDP: Today, the EU hosted a meeting at EU Offices with Human Rights defenders in Myanmar. 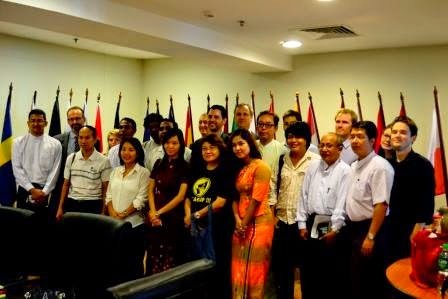 Today, the EU hosted a meeting at EU Offices with Human Rights defenders in Myanmar. The tireless and selfless work of Human Rights Defenders is vital for the ongoing reform process in Myanmar. One of the many ways they can contribute is by holding political actors accountable and making sure that they follow international norms. The EU is determined to work with Human Rights Defenders in Myanmar to create an environment where all members of civil society can act freely. In celebration of the International Human Rights day tomorrow, we met with human rights defenders to discuss the current human rights challenges in Myanmar.